Also check out our website for more info on vehicle wraps, graphics and screen printing in Phoenix, AZ. 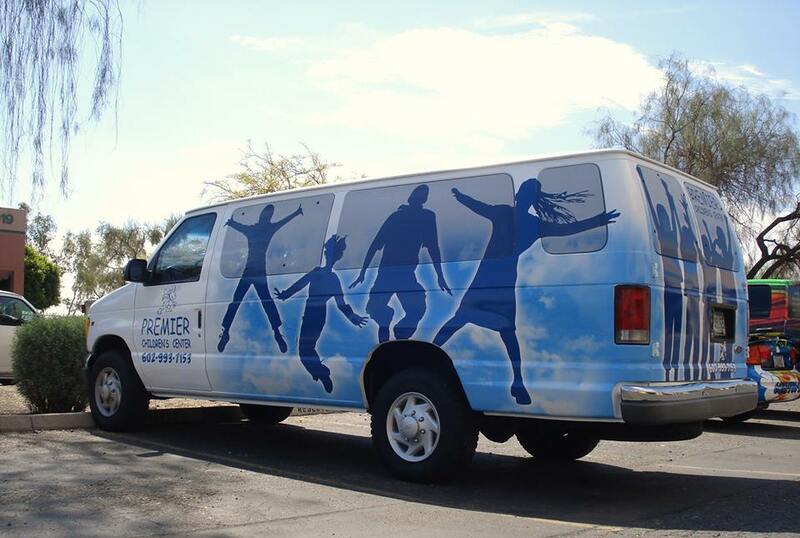 The Vehicle wrap that we completed at Fast-Trac Designs today was for a local daycare. The van was wrapped with 3 panels on each side, window perf to cover the windows and vinyl lettering on the doors. The design displays shadows of kids jumping, portraying a "reach for the sky" message. We also do the screen printed t-shirts for the daycare; they are a sure fan of our work and a loyal customer. We just finished installing a back window graphic on the Red Hot Recovery Mustang 5.0 drag racing car. Red Hot Recovery dropped off the back window and fascia and sat down with our designers to come up with a "wicked" design. We then printed it with a matte finish to match the fascia and installed it in-house. Watch out for it on the track! 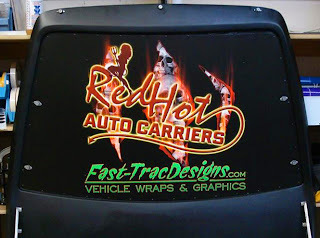 Also check out our website for info on vehicle wraps, graphics and screen printing in Phoenix, AZ.